All too often, when buildings are planned, there has been little thought given to the pavement around it. So, when the Innovation Center and Research Lab was opened in Indianapolis last summer, it bucked the trend. Here, it was not just the facility itself which had been built to exacting specifications. It was also the surrounding parking lots and paving. What can commercial asphalt companies operating in California learn from them? The center’s roads were designed with 8 inches of compacted 36 mm top aggregate base and 4 inches of 19 mm Superpave. Its steel slag SMA is the same as the racing surface of the Indianapolis Motor Speedway main oval, however, with better binder. The center’s parking lot had 6 inches of compacted 53 aggregate and 3 inches of 19mm Superpave. To help with the problem of flooding in parking lots, the asphalt was treated with a special porous paving layer. This comprised of about one fifth air void, to help the water drain from it when it rains. Additionally, these pores have a collection basin under the surface, which will release the water into drainage pools. This stops flooding in the parking areas from becoming problematic. 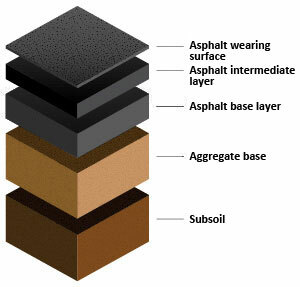 The roads and the parking lots had two different polymer asphalt systems. The parking lots had a 1.5 inch surface lift of 9.5 mm and a PMA PG 70-22. All the paving surfaces had an emulsion applied to them, to fill the voids. This emulsion was specially made to fill the voids on the surface. When it is applied, it should leave only a trace of its residue on the paving surface and will not harm the friction of the pavement. In parking lots, there are a lot of joints which have areas around them with high air void levels. This means they are quite vulnerable to raveling and cracking. These have been sealed with a new technique called Longitudinal Joint Sealant. It is designed to fill those voids close to the joints, helping to improve its long wearing properties and stop it from re-opening. The sealant is also then applied to the concrete curb and helps maintain a pliable inner layer, which keeps the joint that runs along the concrete and the asphalt impermeable. When the roads and parking lots were surveyed for their ability to drain excess water without flooding occurring, it was found only a few spots still had ponding in the rain. In those areas, the surface was milled until it was sloped correctly to allow the water to drain away adequately. Then, the final surface lift was laid. So, instead of the paved areas to the new development being an afterthought and something that was simply placed there without any real consideration being given to it, we can see that the new center had been properly designed and treated. This is something which should be of interest to all business and commercial owners looking to build new premises. It is also something which any asphalt paving contractors in California should want to look at closely, too. By applying a little forethought, with some innovation, first rate engineering and the use of premium grade materials, a high quality parking lot and paved area was achieved for the new center. As well as looking good, the pavements and asphalt surrounding the center now can be expected to last longer and out perform other business’s parking lots, by some considerable degree. It might surprise you to know that asphalt has been around for longer than you might think. Its first usage probably came in south east Mesopotamia – modern day Iraq. Natural traces of asphalt have been found in the area which bridges the Nile in Egypt, up to the flow of the Indus in India. It is possible that the legend of Moses in the reeds was borrowed from a very similar tale, of King Sargon of Accad (Iraq). As an infant he was put into a reed basket which had an asphalt coating on it. Coating boats of all types was one of the first uses for asphalt and it is even to be found in the Bible as a probable coating for Noah’s Ark! The exact wording of the biblical text refers to the vessel being coated with a substance known as ‘pitch’ – on both the inside and the outside – to ensure it was watertight. Asphalt has long been used to seal canoes and dugouts from the water. And bulrushes and ‘pitch’ to create a safe, water resistant vessel was not limited to the legend of Moses in the Bible. It was still being used, right up until modern day. As late as the sixties, it was in use in Baghdad, on boats known as guffas, which transported people across the Tigris. 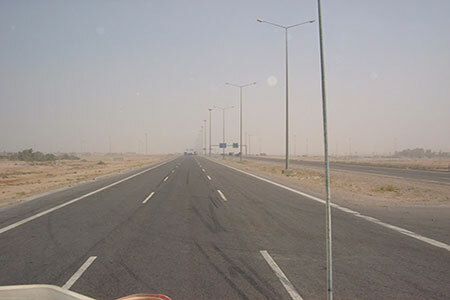 There has been evidence of asphalt in use in ancient Baghdad dating back to around 3000 BC. Other early uses of asphalt include cementing bricks and waterproofing drains. It also was used to protect the outside of buildings from rain, water and weather. Excavations have revealed that the walls the Babylonians built to hold back the river Euphrates contained asphalt. The King Khammurabi (in 2200 BC) documented the respective costs for waterproofing homes and boats with asphalt. 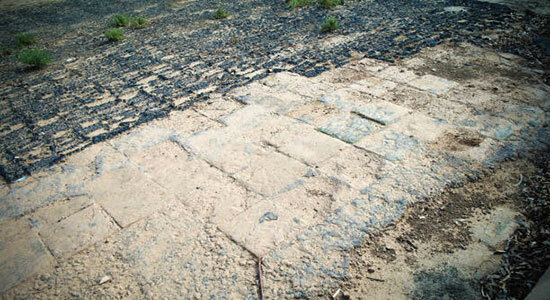 The bricks, which were asphalt coated, have lasted the tests of time and are still in place to date. From these excavations, we have discovered the constructions of another Babylonian king – Nebuchadnezzar. Nebuchadnezzar was the king who innovated to protect against the flood waters which threatened his palace, by using asphalt. This was after observing that the initial wall of dried bricks had not succeeded. The King continued his usage of asphalt construction, when it was clear it worked in keeping out water and flooding. He went on to construct sewers using the material and also use asphalt in the construction of a pier. These are a but a few of the earliest documented uses of asphalt through history – and there are many more!